In its desperation to “stop the boats” the Abbott government has secretly resorted to intercepting and towing boats back to Indonesian waters. After Indonesia denied entry to two Australian navy ships carrying asylum seekers in November last year, it seems that there have been at least five asylum boats turned back by the Australian navy since Abbott was elected. Incredibly at least two of them have been well into Australian waters. One of them may well have made landfall at Bathurst Island, north of Darwin. Abbott has now admitted that on several occasions, the Australian navy has violated Indonesian territorial waters in its efforts to push boats back to Indonesia. 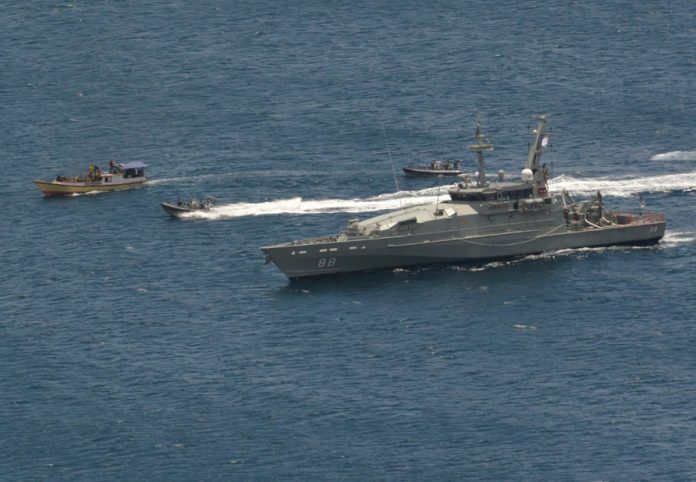 Despite Indonesia’s stated opposition to the tow-back policy, made clear in November, the Abbott government secretly turned back three more boats before the territorial incursions by the navy became public in January. Indonesia now plans to place its own navy frigate in the vicinity of Australia’s tow back operations. But far more significant than violating Indonesia’s territorial sovereignty, the Abbott government is violating the human rights of asylum seekers on a grand scale. The navy is subjecting asylum seekers to the kind of force and military threats that made them asylum seekers in the first place—now the guns are being carried by the Australian navy rather than the Taliban or Sri Lankan military. Scott Morrison has denied allegations that live rounds have been fired on asylum boats to get them to stop, but it is probably true. In 2001, under the Howard government’s similar policy of “deter and deny”, the navy did fire on defenceless asylum boats. Tony Abbott tried to excuse the military action by equating turning back asylum boats with being at war. But targeting civilians or holding them hostage in a war situation is considered a war crime. Abbott is certainly guilty of crimes against refugees. The UN has condemned the turn-back policy as contravening the Refugee Convention. Other experts think that forcibly intercepting boats and forcing asylum seekers back to Indonesia is at least people trafficking and would fit the definition of piracy. Shamefully, all Opposition Leader Bill Shorten is only willing to criticise is Abbott’s media blackout and his damaging Australia’s relationship with Indonesia, saying nothing about the brutality of the tow-backs or demanding he allow the boats to land. Indeed Labor continues to take the credit for offshore processing saying that the PNG deal was all Labor’s doing. Tragically, that’s true. And Shorten goes in using the same language as Abbott, like saying “There is nothing more serious than dealing with the evil trade of people smuggling.” Really?! Labor is completely blind-sided by its own anti-refugee policy. Abbott’s popularity has fallen but Labor will struggle to take advantage until it ditches its Abbott look-alike policy and starts to stand up for refugees. Fairfax has reported that 42 people were intercepted near Christmas Island on 23 December. Four days later, the navy took fuel containers from their boat and left them off southern Java. But the fuel ran out before they could make it to land. They were forced to swim for about an hour to get to shore. A woman and her baby were helped by an Indonesian in a small boat. In 2001, also under Howard’s “deter and deny” policies that Abbott wants to copy, three asylum seekers drowned trying to get to land from an asylum boat that had been towed back and beached off Rote Island. Abbott is playing a dangerous game—asylum seekers have been captured and mistreated by the navy, boats have foundered and asylum seekers have jumped into the sea. It is only luck that, so far, an asylum seeker hasn’t drowned as a consequence of Abbott’s boat turn-arounds. Abbott is desperate to get more serious runs on the board to fulfill his election boast to “stop the boats”. The stand-off with Indonesia may put a temporary halt to his effort to tow asylum boats, but Abbott is reckless enough to try again—perhaps by trying to use careful manoevures to avoid violating Indonesian waters and then pushing asylum seekers into the life boats he bought in Singapore. But his turn-back-the-boats policy shows every sign of being another example of the government going too far and alienating even greater sections of public opinion.